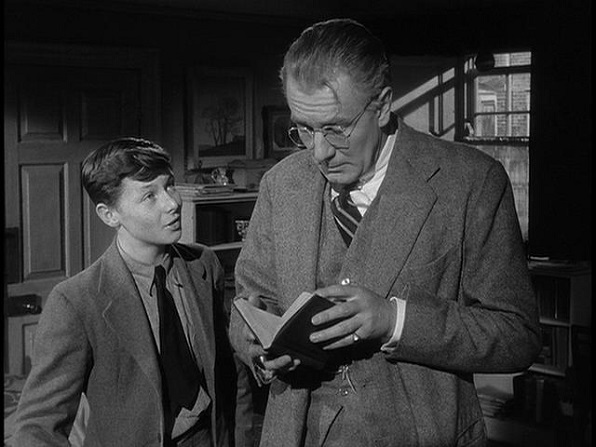 Andrew Crocker-Harris (Michael Redgrave) is “the Himmler of the lower fifth”, a classics teacher in the public school system known for his exacting standards, heartlessness and lack of humor. After 18 years at the same school — without any advancement despite his early signs of promise — he must transfer to a softer job for health reasons. He is denied a pension, which earns his further scorn from his cruel, bitter wife Millie (Jean Kent)… who has been not-so-secretly carrying on an affair with Frank Hunter (Nigel Patrick), a fellow teacher. “The Crock” stoically reflects on a career and a marriage that have resulted in nothing but failure, where only young Taplow (Brian Smith) sees the faint glimmer of humanity in him. This is my third time watching this film, and it only gets better and better. Anthony Asquith is a woefully underappreciated director, even despite having three films in the celebrated “Criterion Collection”. I’ve seen ten of his movies — and hope to see many more — and almost all have been quite good, from his thrilling silent A Cottage on Dartmoor to his delightful adaptation of Pygmalion to the noir-ish psychological drama of Two Living, One Dead. But this one is still my favorite. As I said in my first review, it’s such a breath of fresh air in comparison to the usual “inspirational teacher” trope. Never mind the treacle schmaltz of Dead Poets Society or Mr. Holland’s Opus (though I admit I have a little bit of a soft spot for Stand and Deliver). It’s all too easy to make an audience fall in love with an educator who reaches out to his students, helps them with their personal issues and inspires them to discover the magic of learning. Bleccch. But to make me care about a teacher who berates and humiliates his pupils, denies them even the most harmless loosening of the rules? That takes talent. And that talent belongs to Asquith, playwright (and frequent Asquith collaborator) Terence Rattigan and Michael Redgrave. Lordy, how amazing is Redgrave in this movie? I mean, he’s always pretty great (see also: The Lady Vanishes, The Dam Busters, Secret Beyond the Door) but here he’s simply devastating. Rarely is a “stiff upper lip” performance so beautifully subtle and moving. In the pivotal scene in the film — the one from which the title comes — he just floors me, how could you not get choked up? And then to follow that scene up with Millie’s cruelest moment… that’s the brilliance of the script, the exquisite genius of Rattigan and Asquith, to wind up the tension so slowly and carefully and then dash it all to pieces in front of you. And still Crocker-Harris gathers his pride and his dignity, hiding behind his protective but ill-advised stoicism. But he can launch some quietly devastating revelations of his own from behind that wall. This entry was posted on January 29, 2014 at 9:06 pm	and is filed under Movie Reviews. You can follow any responses to this entry through the RSS 2.0 feed. You can leave a response, or trackback from your own site.